'Futuristic roots music' is the genre tag applied to Floratone's approach, and it's as good a label as any to describe the carefully layered, meticulously studio-produced sound that the basic duo – guitarist Bill Frisell and drummer/percussionist Matt Chamberlain – and their producer-collaborators, Lee Townsend and Tucker Martine, come up with in thirteen shortish cuts on this, the band's second album. Frisell's penchant for this sort of thing, his ability to apply his utterly distinctive guitar technique to everything from blues to country music, relatively esoteric jazz to straightforward rock etc., ensures that a wide variety of musical bases are touched in this set, and Chamberlain's stylistic net is cast just as wide, but – as with a number of recent Frisell projects – admirers of the guitarist's work with the likes of Power Tools, the Paul Motian Trio, or his own bands under the 'downtown' rubric in the 1990s, are likely to to regret the absence of the unfettered, hard-edged soloing that characterised his playing in those outfits. 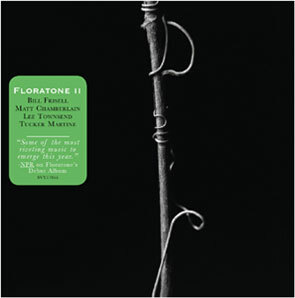 This may, however, be to miss the point of Floratone, which exists to explore the range of textures and timbres that can be produced in a studio context, and the thirteen shuffles, wispy floaters and intriguing grooves laid down by the core quartet, and augmented by viola player Eyvind Kang, cornetist Ron Miles, bassist Mike Elizondo and keyboard player Jon Brion, certainly do this, in spades.